This MAb recognizes full-length MUC1 in a glycosylation-independent manner and can bind to the fully glycosylated protein. MCF-7 or MDA-231 cells. Breast, colon, ovarian, endometrial carcinoma. This MAb recognizes full-length MUC1 in a glycosylation-independent manner and can bind to the fully glycosylated protein. 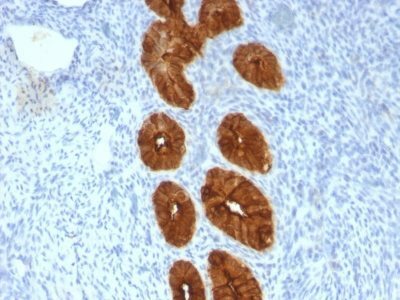 The dominant epitope of this MAb is APDTR in the VNTR region. It reacts with the core peptide of the MUC1 protein, which is a member of a family of mucin glycoproteins that are characterized by high carbohydrate content, O-linked oligosaccharides, high molecular weight (>200 kDa) and an amino acid composition rich in serine, threonine, proline and glycine. The core protein contains a domain of 20 amino-acid tandem repeats that functions as multiple epitopes for the MAb. 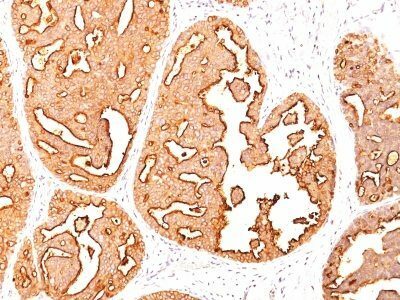 Incomplete glycosylation of some tumor-associated mucins may lead to variable unmasking of the multiple peptide epitopes leading to the observed differences in staining intensity between normal and malignant tissues. This MAb reacts with both normal and malignant epithelia of various tissues including breast and colon. 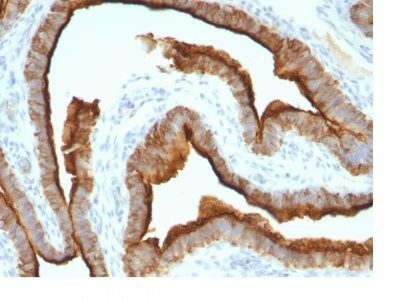 Catalog number key for antibody number 0967, Anti-CD227 (MUC1/967) The prefix indicates conjugation, followed by the antibody number and size suffix.